Greetings, dear readers! I am now back in town after a short family vacation, and I am eager to jump in and share a few things here on my blog. For this evening's blog post, I am delighted to share another option for the upcoming April Polish Pickup. 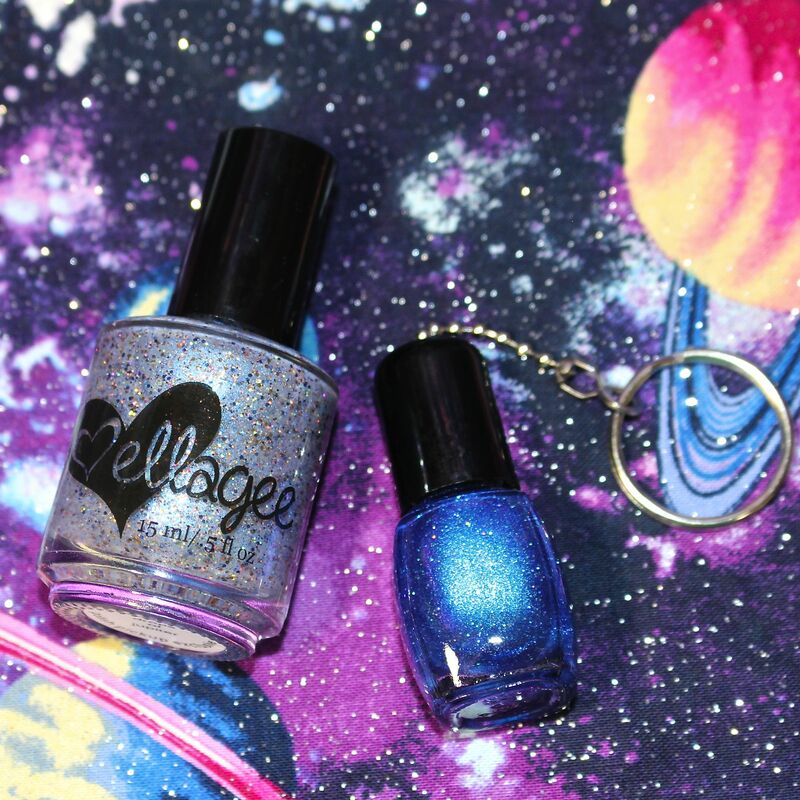 Ellagee Polish has joined in with two offerings for the Planets & Galaxies-themed month: a lovely polish and a keychain. Let's get a closer look at these choices, starting with the polish! Drops of Jupiter consists of a translucent iridescent blue base with vivid blue shimmer and a glitter combination in shades of blue, bronze, and copper. Inspired by a photograph of Jupiter by NASA's Juno spacecraft, Drops of Jupiter is a polish that is unique to my collection. While the base itself is on the sheer side, it is packed with glitters so I was able to reach opacity in just three coats. Even with all the glitters in this polish, Drops of Jupiter still had a nice consistency that was easy to work with, and the glitters dispersed perfectly across my nails. This polish will retail for $11 per bottle, and there is no limit to how many bottles are available for purchase. For the days when you don't want to wear the universe on your nails or just can't due to work limitations, Ellagee still has you covered! 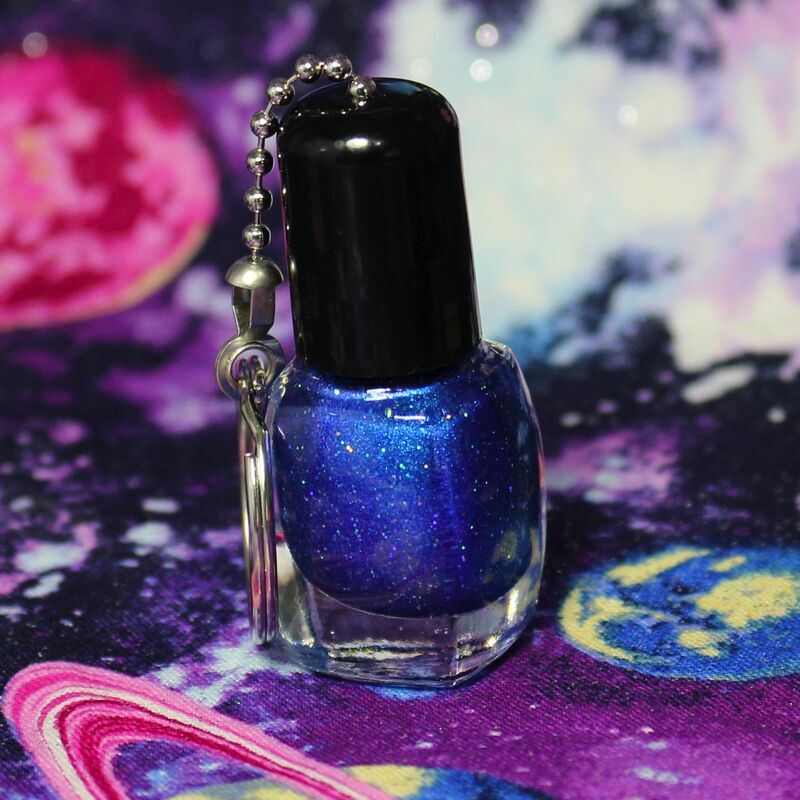 This mini nail polish bottle keychain will show off your love for both nail polish and all things planetary with a shifty-galaxy-inspired beauty! The polish inside the bottle has been dried completely, so you won't have to worry about any spills in your handbag. The Universe in a Bottle keychain utilizes a standard keychain ring and a silver-toned ball chain with loop attachment. This will retail for $8 per keychain, and it is capped out at 100 total. If you have your eye on The Universe in a Bottle keychain, this may be one of the first things to pick up in case it sells out. 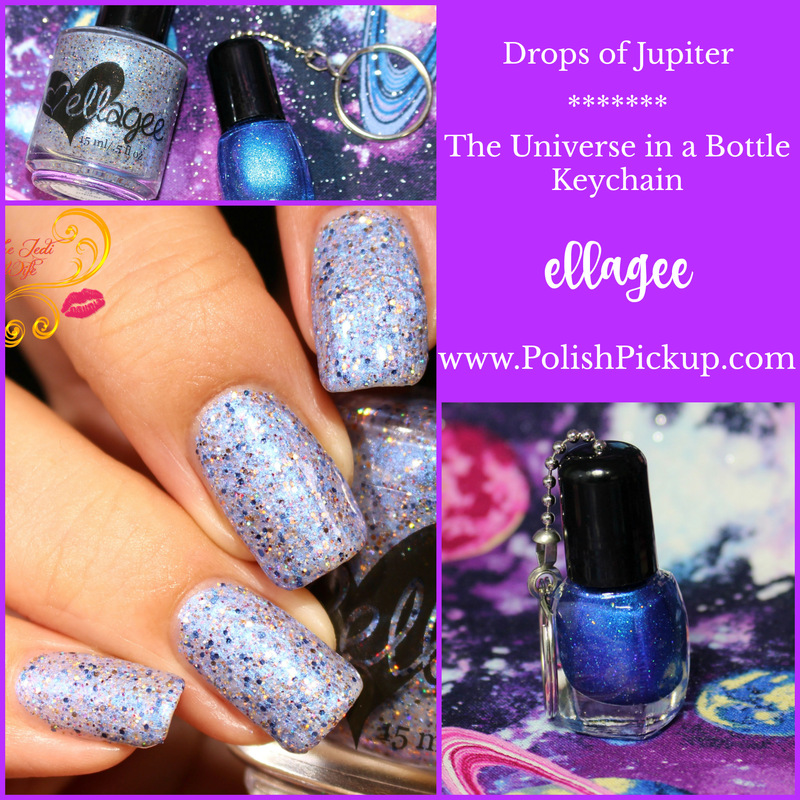 Both Drops of Jupiter and The Universe in a Bottle Keychain will be available from the April Polish Pickup only. The shop will be open from this Friday, April 6th through Monday, April 9th. If you want to order either of these items, be sure to pick them up during this time window so you don't miss out. Also, you may want to keep in mind that the keychain is capped at 100 units, so if it sells out early with the shop launch, no more will be made available. Are you excited about the upcoming Polish Pickup shop opening? What are you planning to pick up? I'd love to hear from you! Beautiful polish, and I love this whole concept of the collection! Drops of Jupiter is gorgeous! That keychain is too cute! Plus that polish is pretty. I need that keychain. It would confirm my madness for polish. Wow what an interesting texture! What a fun polish and cute keychain! The bottle keychain is so cute! The keychain is so tiny and cute! This polish is so pretty. I love how packed with glitter it is. I used to have a key chain from Ellagee but it recently bit the dust after 4 years. This is such a stunning polish! It's a beautiful polish and the keychain is adorable! I love the golds and blues together. Such a pretty combo. I theme of the universe!